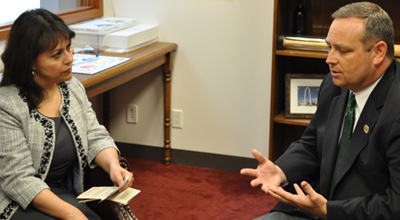 The following interview with Texas State Representative Rodney Anderson is one of a series of interviews conducted by VOCES Action and TexasGOPVote with members of the Hispanic Republican Conference in the 82nd session of the Texas Legislature. 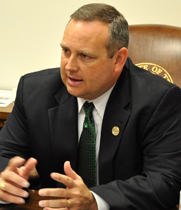 Rep. Anderson is a member of the Texas House of Representatives representing District 106, which includes Grand Prairie, Irving, and part of Dallas. Rep. Anderson is a freshman in the House of Representatives. We had a good conversation where he shared with me why he decided to get involved in politics. District 106 is composed of a majority of minorities. Rep. Anderson explained how he spent 6 months getting to know the community, knocking on over 15,000 doors during his campaign. The people of his district are concerned about three issues: jobs, illegal immigration and taxes. Rep. Anderson explained why he joined the Hispanic Republican Conference and also his participation in two House Committees, Economic and Small Business Development and Land and Resource Management. Adryana Boyne: We're glad to be here with Representative Rodney Anderson from the Dallas area. Representative Anderson, thank you for agreeing to give us an interview today. Rodney Anderson: Thank you for having me. Adryana Boyne: Well we know that you are really busy in this session, but we just want to take some time so that people can get to know you. First of all, I would like to ask you if you can tell us a little bit about your background and how you chose to enter politics. Rodney Anderson: Well I am a lifelong resident of Grand Prairie, I was born and raised there, and after a lengthy discussion with friends and family, I made a decision on my own to go ahead and run for state representative. My wife and I had talked about running for school board or city council or something like that. On December 31st, I went to pay my property taxes, and I asked myself the question, am I getting my money's worth? The answer to that to me was no, and so I went to the Dallas County Republican Headquarters, and said I'd like to file to run for office, and they kind of looked at me like who are you, where'd you come from, and that's how it came about. I'd never been involved in city politics, I'd never been on school board, city council. It was just something that I'd made the decision, was I getting my money's worth and the answer was no. That's why I ran. Adryana Boyne: Certainly one thing that we noticed in your district is that it's made up of a majority of minorities. Can you tell us a little bit about your district and what led to your election as representative of your district? Rodney Anderson: I am a little unique in that I am a Republican that represents a district that is 50% Hispanic, it is 15% African American, and 5% other. We're a 70% majority minority district, and a lot of my success I attribute to being actively engaged with my entire community, not just the Anglo population. We spent a great deal of time over a 6 month period knocking on doors, attending from various groups, parades, events that we put on, campaign events, but the majority of it was done door-to-door. I was not one of these candidates that was financed by large groups. We received some outside money, but I'm not a wealthy individual either. Grand Prairie is a blue collar suburb that knowing the people that I represent, it was a complete surprise to beat the mayor, the mayor's son, who was in that seat, and we did it by knocking on almost 15,000 doors over a 6 month period of time. Every Saturday, every Sunday, we were out in the community talking to people. They'd be in their front yards, or they'd be gardening, washing their car, or they'd just be out having fun, and we would talk to them and say what do you like, or what do you not like about government, and then we'd let them talk from there, and find out what they'd really want, what they're concerned about, and it was that personal touch, I think, that led to my election. Adryana Boyne: Mr. Anderson, you are talking about knocking on people's doors in the time of your campaign, can you tell us a little more about what the peoples' responses were and what were their main concerns? Rodney Anderson: The first thing they were surprised about was that it was actually a candidate knocking on their door because most candidates don't do that, but their biggest concerns were, this cut across all ethnic makeup, Hispanic, African American, White, it didn't matter, it was jobs first, illegal immigration was second. I didn't run across any person that has any problem whatsoever with a much broader immigration policy, but everyone is concerned with illegal immigration. So it was jobs, illegal immigration, and then taxes, please do not raise taxes because most people can draw the correlation that if you raise taxes on businesses, if you raise taxes on individuals, less money is going to go into the economy, which means since 75% of our budget is sales tax, raising taxes on businesses causes them to cut jobs. If you raise taxes on individuals, they stop spending, and it becomes a downward spiral, but those were the three main topics. Adryana Boyne: It's interesting, as a National Director of VOCES Action, I deal a lot with what is the moral and fiscal values, but since I'm a Hispanic, they ask me a lot about immigration and illegal immigration, and certainly, would you mind to briefly explain what is your opinion on what could be a good solution to fix the problem of illegal immigration, certainly we know that there are people in both extremes, and I would like to know a little bit about where you stand on that? Rodney Anderson: You are right, there are people on both extremes, and I am one that tends to look at it, I had someone that is a Hispanic man say what we need to have is we need to have very high walls, but very wide gates, and when we talked about it, it made perfect sense. We as a country need to know the people that are here. If people want to come here, I am all for it, come on, with a guest program or a broader visa program that allows people, the Statue of Liberty says, "Give me your tired your poor, your huddled masses yearning to breath free, send these, the homeless, the tempest, tempest-tost to me." That's what it says, and it greeted immigrants from all over Europe. Well now it's like there are some people that don't want any immigration, and then there are some that want everybody to be here, regardless of, and no we can't have that. It is a two-pronged issue, number one, we have businesses here that are hiring people illegally and taking advantage of the people that they shouldn't be taking advantage of. I have a real, real problem with any business that does that. Those businesses that do that, should be fined out of existence. Number two, we have people though that want to come here that don't want to come here legally, that don't want to wait in line. I can't exactly say that I blame them when the line is 8,9,12 years down the road. We have to broaden our immigration program to where we can accept more people in that want to work her, that want to become citizens, that if they want to serve in our military. If they want to do those things, I am all for it. We have to approach it from both sides. If you have the demand for workers, which goes squarely back to companies, if you have that demand, the supply will be there, and so we have to attack both sides of that equation. Adryana Boyne: Why did you choose to be part of the Hispanic Republican Conference here in the House? Rodney Anderson: When Aaron Pena invited me, he said you qualify, do you want to join, I said absolutely. He said your district is not such that you can be a voting member. I said wait until the census data comes out because over the last ten years, the Hispanic population in Grand Prairie and South Irving has exploded. It's gone from 28-29% to where it is now almost half, it's 49.9% to be exact, and so now I am a voting member of the Hispanic Republican Conference, and as soon as Aaron asked me, I said absolutely because again, the growing Latino population, we as Republicans have to reach out to them, we have to because if we don't, again through the state of Texas, Latinos are going to be the largest portion of the population, and what I have found, and when I sit down with Latinos is that most of them are conservative by nature, they're very hard working, they're very pro-family, the majority are Catholic. That is a conservative voter, but we as the Republican Party haven't done a very good job of reaching out to say this is who we are, you're the same way, we just happen to have a different skin color, and I think that's one reason I can relate to people. I can sit down and have a conversation with someone who's not Anglo, and I'm not talking down to them, I look at them as they're people just like me. They go to a job, they work, they want to take care of their family, and so when Mr. Pena asked me if I wanted to be a part of the Hispanic Republican Conference, I said absolutely, without question. Adryana Boyne: Well certainly we are excited about that. Now I know that you are a freshmen in the House, but certainly you are already busy, especially in the committees that you are involved in. Can you tell us a little bit about those committees that you are involved in? Rodney Anderson: I was very fortunate, one of the committees that I requested to be on was the Economic and Small Business Development because I'm a small business man. I work for a company called Commerce Title, and they have been very good about allowing me to be down here to work. I'm not an attorney, but I'm a small business man. The bills that come before our committee involve everything from the governor's enterprise fund of how to best use that to Texas Workforce Commission issues. The second is Land and Resource Management of being in the title business. One of the biggest bills that we have taken up so far is the eminent domain bill, one of the governor's emergency items, and with my title background, it fit very, very well with that. I was actually able to help create language within the Senate Bill to make sure that the by back provisions didn't create problems for the public record, and those are the two committees that I've been on, in addition to the Hispanic Republican Conference. Adryana Boyne: I'm from North Texas, from Denton County, Highland Village, Tan Parker is my State Representative. Rodney Anderson: I know exactly where Highland Village is, I used to run a title company up in Flower Mound and Lewisville. We had an office in Denton, so I know exactly where Highland Village is. Adryana Boyne: I want to thank you for not only serving your district but for serving all Texans. Thank you very much. Rodney Anderson: Thank you so very much. It's a pleasure.